Retail price: $49.95 (educational pricing) stand-alone; $149 as a program in the integrated Serif Design Suite. Suite site licenses start at $2,200. Windows-compatible DrawPlus X4 2D and 3D graphics tools create and polish Web images, stop-frame and key-frame Flash animations, logos, photos, and illustrations for print and digital projects. The latest version adds several features and enhancements. Quality and Effectiveness: Serif’s DrawPlus X4 provides a student-friendly alternative to Adobe Illustrator. Its graphics tool kit is available for about half Illustrator’s price. While DrawPlus has been around for some time, the latest release adds features to, and upgrades others in, its collection of standard Bezier tools; customizable brushes; specialeffect filters; and start-up templates. It even opens Adobe Illustrator (.ai) files (V9 and later) and saves key-frame animations in Adobe Flash (SWF) format. Ease of Use: Start-up templates, video tutorials, and onscreen How-To Guides provide step-by-step directions for a variety of design tasks. Movie tutorials streamed from the Serif Web site teach users how to create rollover Web buttons, animated Web banners, and 2-D charts and plans. Creative Use of Technology: This program supports text-to-path drawing as well as freehand curve designs. A touch-sensitive Paintbrush lets users draw with pressuresensitive graphics tablets instead of a mouse. They can use the program’s Connector objects to link boxes and symbols in technical drawings and organizational charts. Suitability for Use in a School Environment: This vector-graphics application has a rich tool kit for logos, Web-page banners, technical drawing, and animation design. Unlike Adobe Illustrator, which requires at least 1 GB of RAM and 2 GB hard-drive space, DrawPlus X4 will run on Windows computers with as little as 512 MB of RAM (though going to 1 GB will improve performance) and less than 1 GB hard-drive space. 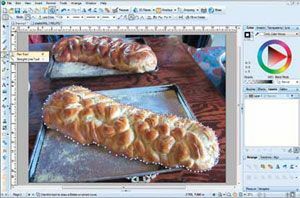 DrawPlus X4 is a suitable inexpensive, feature-rich vectorgraphics application for Windows-based schools running 32-bit versions of Microsoft Windows XP, Vista, or 7. It may not be as practical in environments where time and budget constraints require the integration of software that offers versions for both Macintosh and Windows. ¦ This versatile 2-D and 3-D graphics application integrates a rich collection of tools for vector artwork. ¦ It supports several layers, gradient fills, customizable drop shadows, transparencies for shading and reflections, and much more. ¦ It’s less expensive than Adobe Illustrator.